Hot, and tired, Christopher and I are just finishing our walk from the Academy to the Lyceum. We have not been drawn into truncating our journey, it is true, by the promise of some discussion with beautiful youths in a wrestling school. But I confess that my eye, fulfilling its evolutionary function, has, willy-nilly, selected some dark-eyed Greek beauties along the way with whom, in another life, I might well have paused for some philosophical conversation. We reach our destination, and find we have to get down on our hands and knees in order to peer under the solid fence, getting the only view of the Lyceum possible these days. Then we stand up, dust off our pants, and start back to the hotel. On the way, we find a likely looking bar with tables on the sidewalk, and stop for a little break. Penner, T. 2005a. 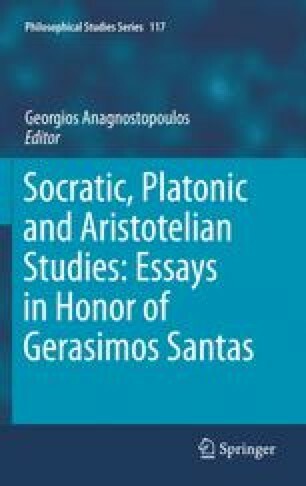 “Platonic Justice and what we mean by ‘justice’.” http://www.nd.edu/-plato/plato5issue/Penner.pdf (76 pp. ).